Startcleaner is a freeware that helps users to remove startup programs from Windows startup list. Startup programs are those programs that run automatically when Windows start. But there are some useless programs that come in startup list and result in slower Windows boot time. Startcleaner lets you remove those unwanted programs and helps to improve Windows boot speed. Startcleaner comes with a very simple interface and shows the list of all startup programs automatically. It scans Windows registry and startup folder to find out all startup programs and generates a list of those programs on its interface. From that list, you can select programs that you don’t want any longer to remain in startup list. But unlike, other startup program managers, Startcleaner doesn’t provide feature to add new programs to startup list. Just like its name suggests, it is built to clean startup entries to make Windows startup faster. A very simple software to remove unwanted programs from startup list. It can also show you those programs (dead programs) that are in startup list, but are not available on your PC anymore because you have uninstalled them. Automatically loads list of all startup programs on its interface. Portable software. Installation is not needed. Simply download its application file and double-click to run it. Free of cost available for everyone. Startcleaner is very lightweight and doesn’t use lot of system resources to slow down the PC. How To Work With This Startup Program Cleaner To Remove Startup Programs? Startcleaner comes with an application file which is around 1 MB in size. So within a few seconds, it will be available on your PC. You can download it using the link present at the end. After this, run the application file to open its interface. Immediately after opening its interface, list of all startup programs will be available automatically. 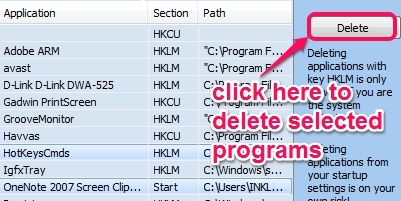 All programs with HKLM, Start, and HKCU key will be available which you can select and delete accordingly. For removing HKLM key programs, make sure you are working on your PC with administrator account. Startcleaner is a very simple and basic software to clean unwanted programs from Windows startup list. We have reviewed more useful startup managers that can remove unwanted programs, can help to add new programs to startup list, as well as allows to disable unnecessary programs which can be enabled whenever needed. These programs are: AnviStartupBooster, Chameleon Delayer, Argus Boot Accelerator, and Synei Startup Manager. You should go through these suggested programs if you need more than just a startup program cleaner. If you still want a simple software that cleans unwanted startup programs, then try Startcleaner.